So Thursday started rough. I hate being a big whiney baby about jet lag, but jet lag turned me into a big whiney baby. I went to bed at 11:30 on Wednesday night, comforted by the fact that I could wake up whenever I felt like it as I had nothing specifically planned for Thursday. Sadly, my highly defective brain decided to wake me up at 2:50 AM instead. I even tried taping my eyes shut and considered using superglue, but nothing worked. This always happens at least one night when I’m in Asia, and it is absolutely no fun whatsoever. However, the best way I know to fight jet lag is the advice I got a long time ago: pretend that you don’t actually have it. I hit the gym, got a good breakfast, and hit the road. This is my next best tip on dealing with savage jet lag: walk. A lot. It’s kind of being like a shark — the second you stop swimming you drown. Despite feeling like poop, I couldn’t help but like Hong Kong even more. By my third day, I was becoming a veteran of the little ferry that shuttles back and forth between Kowloon and Hong Kong Island. I love any mode of transportation that only costs 35 cents each way, and it seems to run about every 10 minutes. So on the boat I jumped and headed over to Hong Kong to do a march around that part of the city. I walked down Queens to get to one end of the central district, and I walked Hollywood (then Wyndham) to get back to the other side. One of the unmistakable aspects of Hong Kong is that it has an awful lot of shops selling just about everything you can imagine and a lot you can’t. Of course, Hong Kong has its full suite of fancy-pancy stores, but you can find that stuff most places these days, certainly including NYC, my nearby stomping grounds. Frankly, I was more fascinated by the sheer mass of random knick-knakcy things and other even more bizarre items that seem to be available anywhere. Hollywood Road is known as a Mecca of antiques, jade, etc. It also happens to have some really cool art galleries including a lot of great contemporary stuff, as well as tons of cool restaurants, cafes and bars. While impressive in its shopping breadth, it really begs the question of who exactly it is that buys all of this? How do all these stores manage to stay in business? Is there really that big a market for little Buddha’s and jade dragons? That said, I totally get the stores that sell the weird stuff. Of course there are the obligatory and excellent shops selling all manner of odd dried goods. 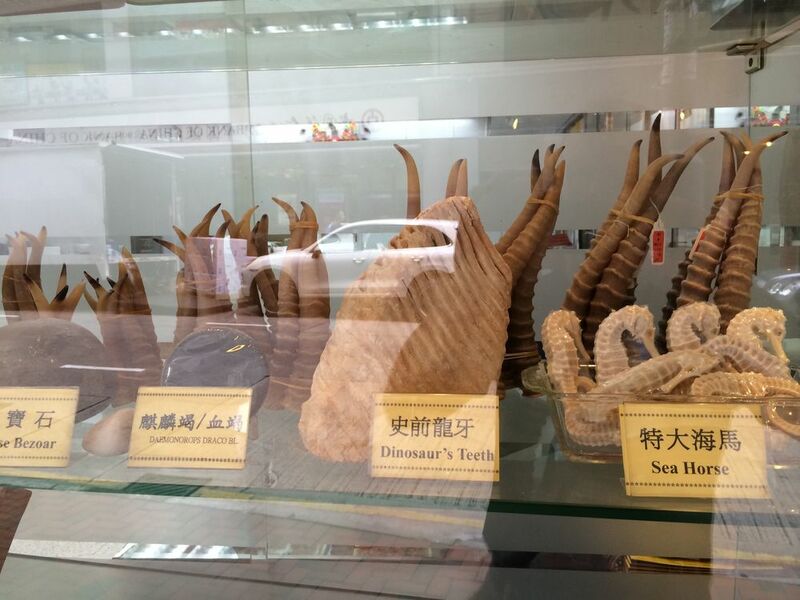 Do you have any inventory of dinosaur teeth and deer antlers? I’m in! 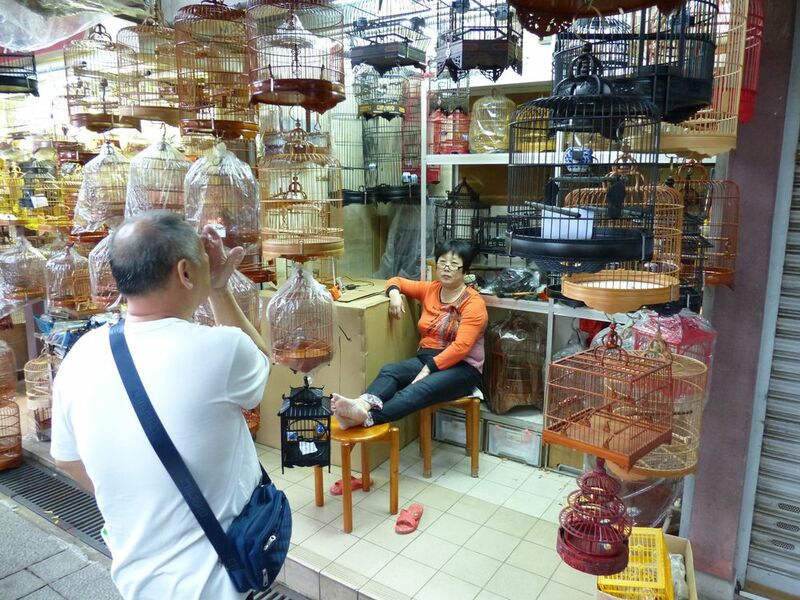 And what self-respecting city wouldn’t have an entire outdoor market dedicated to the sale of small birds? Of course, I expected Hong Kong to have a different dining option for each of it’s seven million residents, and I tried a bunch. But when in Hong Kong, everyone told me that dim sum was the only way to go for lunch. My guide Thomas took me to a place that was a third floor walk-up in a nondescript building. We were the only two non-Chinese there, and we shared a table with two Chinese gentlemen who kindly chose not to mock my cluelessness. It was quite the tasty meal and a bargain at 110 $HK for two (less than $15 US) — cheaper than McDonalds. My final overwhelming observation about Hong Kong is that it is truly a beautiful city. The collision of crowded, hyperactively lit streets, spectacular high rises and lush greenery everywhere creates truly excellent sensory overload. The place just buzzes all the time. It’s modern, funky, global, cultured, contemporary and yet still very Chinese. My guide Thomas came to HK 20 years ago from Denmark when he was 23. He never moved back. I had drinks with a friend of a friend who came to HK from Canada three weeks after graduating college 25 years ago. He never moved back (well, we are talking Canada).